China is not the only solution for export-driven manufacturing, and Asia’s trade evolution is determining that business models move on for adventures elsewhere. At the turn of the 21st Century, there were two main schools of commercial thought with regards to China. The most popular was that China represented a massive market to sell to with roughly 1.3 billion potential consumers. The second was that China had a young, available and inexpensive work force that was relatively skilled and disciplined. While the latter has proven the dominant economic driver for the past two decades, China’s one-child policy (implemented nationwide in 1982) has meant that the nation’s supply of cheap labor has been drying up – and is now doing so at an increasingly rapid rate. China today is one of the fastest aging populations in the world – a fact that has not gone unnoticed by the central government. Wary of inheriting a huge population of aged, but poor citizens, it has been state policy over the past few years to get more money into the pockets of Chinese nationals and to implement what by global standards is a relatively expensive, contribution-based state insurance scheme. These policies have had the effect of increasing minimum wages across the country by an average of 12.6 percent each year from 2008-2012, with this impacting vertically upon more senior-level employees. It is hard to justify to senior staff that lower level employees have increases of 12.6 percent when senior employees cannot. The effect, therefore, of raising the minimum wage has been a massive wholesale increase in salaries across businesses based in China at all levels. When you combine these base salary increases with every employer’s mandatory social insurance and housing fund contributions at roughly 35-45 percent on top of salaries for each employee, these costs begin to add up fast. Even relocating a factory into the relatively inexpensive inland regions of China is proving a false economy – firstly because increased infrastructure and transportation costs eat into most of the savings, and secondly because these areas too are experiencing large increases in wage overheads. While all of this is good news for businesses wishing to sell to China, it is becoming increasingly difficult for export-driven businesses to justify a China presence – unless at least part of that production is destined for the domestic market. Yet even here, competition is just around the corner. Competition for this type of export-manufacturing business model is appearing right around the corner as China’s free trade agreement with ASEAN kicks in come 2015. This means that factories based in Southeast Asian countries, such as Vietnam, can soon sell products duty-free to the Chinese consumer market. When one then factors in Vietnam’s lower wages and land-use costs, the implications are clear. Vietnam has even gone to the extent of directly targeting China as a key competitor for manufacturing-based, export-driven foreign direct investment. It has recently passed legislation dropping its corporate income tax level to two points below that of China beginning January 1, 2014 and, like China did 20 years ago, has introduced sweeping investment reforms and numerous new export processing and manufacturing free trade zones along its eastern coast. Consultants still selling the China story will suggest Vietnam’s infrastructure is not up to par, but that too is rapidly changing with the Vietnamese government introducing massive construction projects and road, rail and port development schemes. A drive from the airports in Hanoi and Ho Chi Minh City into their respective downtown areas will provide a visual snapshot of the large-scale infrastructure development now taking place in the country. It is prudent to recall that not so long ago, China used to look like one big construction site as well. There are also other drivers at work here. An increasingly wary United States is becoming concerned with placing all of its purchasing needs into a single China basket; a feeling shared by many of China’s neighbors. Alarm bells went off globally when China suddenly cut supplies of rare earth minerals to Japan after a political spat, and concerns over China’s tendency to use trade ties to strong-arm other countries into bending to its wishes is also having an effect. Hedging the China risk is now influencing the spread of global manufacturing across Asia. India, meanwhile, also represents an attractive alternative to today’s China, as it actually bears a strong resemblance to China 20 years ago – with its massive consumer market and an abundant, young and inexpensive work force. Overall, operational costs in India remain far lower than China, and like Vietnam, any executive arriving at the new international airports in Delhi or Mumbai, or taking a trip along the highway into either city center, cannot fail to be impressed by the scale of development – construction sites and cranes are everywhere as the country rapidly upgrades its infrastructure. The East Indian port city of Chennai is a classic example. While the media focuses on Delhi and Mumbai, Chennai is home to the third-largest expatriate population in India. It is also a manufacturing home for multi-national corporations, including Nokia, BMW, Siemens, Dell, Motorola and Foxconn among many others, while it hosts the Asian headquarters and back-office operations for many global financial institutions. There’s also the matter of India’s own middle class, which is currently about the same size as China’s at 250 million – making it a rising star as a combined base for export manufacturing and domestic sales. India is now one of the few countries where both cheap labor and a large, wealthy consumer class go hand-in-hand. 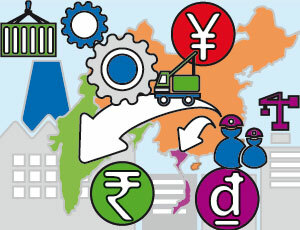 In short, investors that are able to look beyond India’s perennial issues – such as its inadequate (but rapidly improving) infrastructure and a large, loud democratic government that at times is slow to put forward necessary reforms – should be able to add value to their global operations by investing in India. The reasons for these developments are clear. As China’s working population ages and becomes more expensive, alternative Asia beckons. 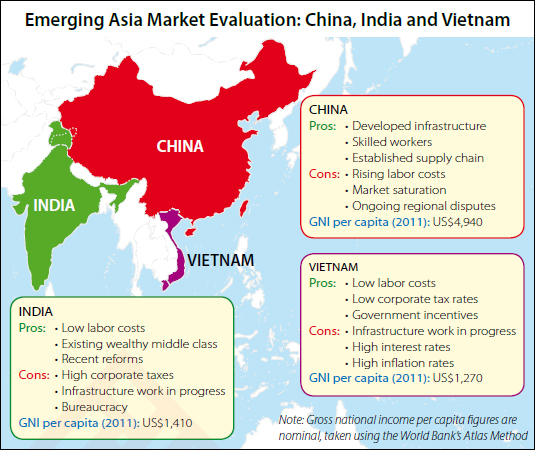 Vietnam in particular is leading the new Asian wave of investment for export-driven manufacturing, while India now offers not just export manufacturing opportunities, but also – like China – the ability to sell to an increasingly wealthy middle class population. China’s continuing evolution can perhaps best be explained in a re-calibration of the popular opinion at the turn of the century that the 2000s will belong to China, much like the 1800s were dominated by the British Empire and the 1900s saw America’s rise to prominence. No, the 21st Century will more aptly be headlined as “Asia’s Century,” and although China will very much be a part of that, other countries in the region will be too. For those businesses that are involved in export-driven manufacturing, it is the Asian connection that now counts. This is the chief reason why China’s role within global trade and the development of emerging Asia should now be re-assessed in order to better absorb the ongoing financial battle between production costs and the demands of the global end user.